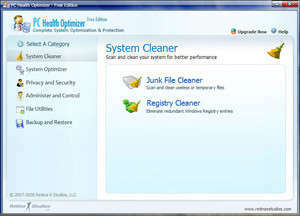 Featuring a set of 10 different tools in various areas, PC Health Optimizer (Free Version) will improve the performance of your Windows-based system by performing clean-up and optimization taks on the registry, your system memory, hard drives and more. It also features some anti-spyware protection. After running this program, expect to notice improved performance on your Windows system, especially if some of your ills have been caused by nasty spyware applications running in the background. For security reasons, you should also check out the PC Health Optimizer download at LO4D.com which includes virus and malware tests. Additional screenshots of this application download may be available, too.